This round birdwatching design is a great way to show you're a local birder in California! The state is shown in red with a flock of fowl flying. 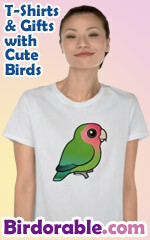 Be a proud birder in this great original design!